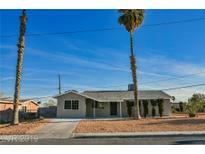 Below you can view all the homes for sale in the Regal Estates subdivision located in North Las Vegas Nevada. Listings in Regal Estates are updated daily from data we receive from the Las Vegas multiple listing service. To learn more about any of these homes or to receive custom notifications when a new property is listed for sale in Regal Estates, give us a call at 702-323-5952. *will Not Last At This Price! * A Must See. 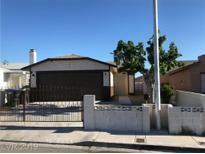 MLS#2087813. Realty 360. 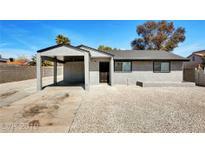 Spacious front yard along with carport with extended driveway and fit multiple cars. 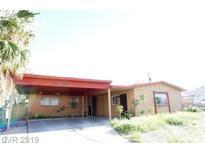 MLS#2086944. Realty ONE Group, Inc. This Turn-key Home Is Priced To Sell Fast! MLS#2080163. eXp Realty. *central*1 Story Over 1,100 Sq Ft*modern Remodel*open Kitchen Upgraded*open Living/Great Room*cozy Masterbed*larger Secondary Beds*1ba*rv Parking* Close To Freeway Access*schools*dining*parks*and More* MLS#2073990. Keller Williams Market Place. New kitchen cabinets, granite. Bathroom newly remodeled. MLS#2069091. Urban Nest Realty. Large blank canvas front and backyard, w/large tree in front. Room for RV MLS#2054545. Innovative Real Estate Strateg. *ask About Our Rent To Own Lease Option Program*lease Buyout-30 Day Move-in MLS#2013788. Turn Key Property Solutions.